Oct. 25 (Bloomberg) -- The Treasury sold $10 billion of five-year Treasury Inflation Protected Securities at a negative yield for the first time in the history of U.S. debt. The securities drew a yield of negative 0.55 percent, the same as the average forecast in a Bloomberg News survey of 7 of the Federal Reserve’s 18 primary dealers. The bid-to-cover ratio, which gauges demand by comparing total bids with the amount of securities offered, was 2.84. The average at the last 120 auctions was 2.38. The sale was a reopening of an $11 billion offering in April. “These negative yields are being driven by the Federal Reserve and their push to increase inflation expectations,” Michael Pond, co-head of U.S. rates strategy in New York at Barclays Plc, said before the sale. The firm is one of 18 primary dealers required to bid at Treasury auctions. The U.S. can only sell debt at a negative yield on inflation-linked debt, according to McKayla Barden, a spokeswoman at the Bureau of the Public Debt. Conventional fixed-coupon Treasuries of a given maturity could be sold at price above face value with a zero percent coupon if yields in the market on that maturity were negative. The government began selling inflation-protected debt in 1997. The sale was the first of four this week totaling $109 billion. The last TIPS auction, on April 26, drew a yield of 0.550 percent, which was the lowest on record. The bid-to-cover ratio was 3.15. Treasury 30-year bonds rose for a second day, leading a rally in Treasuries, amid speculation on how much debt the Federal Reserve may buy to spur the economy and before data that may show economic growth was below average. Ten-year note yields fell for the first time in four days, shrinking the difference between 2- and 10-year yields before the Fed meets next week. Treasuries gained even as data showed sales of existing homes rose. The U.S. is scheduled to sell $10 billion of five-year inflation-linked securities today, the first of four note auctions this week totaling $109 billion. “Whenever we see a bit of a selloff in the Treasury market it is getting met, and will continue to get met, by renewed buying until we get clarification with regards to the size and frequency of the Fed’s asset purchases,” said Christian Cooper, senior rates trader in New York at primary dealer Jefferies & Co. This is a manifestation of how QE is sowing the seeds for the final destruction of wealth. One of the fully intended consequences of QE is to drive real rates into negative territory which the pushes people further out the risk curve. The causes risky assets to get more expensive as spreads tighten to a point well above fair value as an asset price bubble is actively being encouraged. As soon as QE has any level of success at all, nominal rates rise followed by real rates. Soon after that, the spreads on risky assets blow out as people who bought risky assets due to negative real rates no longer need to do so. QE is the ultimate in misselling. Central bankers are actively encouraging people to buy assets which will collapse in price once the monetary crisis is over. 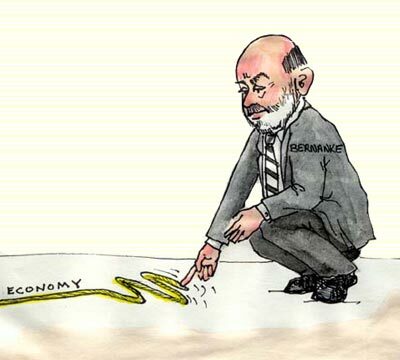 Bernanke, either on his own or with Gertler, wrote a paper 10 to 15 years ago specifically outlining the way that QE should impact investors. So far, he is following the script that he layed out exactly. They've flooded the markets with excess liquidity. Where's that going to go? So far, he is following the script that he layed out exactly. The thought occurs that with a gentle bossa nova playing in the background and the careful co-ordination of market operations teams, you could effectively NIRP on the regular Treasury too. All you need do is provide, then withdraw price support at auction. Somewhat similar to say the way the SNB's* trading EURCHF through USD. index linked bonds pay out at least your investment plus inflation. there then IS a yield on these, just they took the inflation rate (expected) and are hoping the inflation rate increases????? NIRP on nominal bonds has a floor though. It is the cost to guard, fireproof and insure cash held in a vault somewhere. About 50 or 60 bps is my guess. If we ever get serious deflation, bond holders will enjoy juicy, positive real returns after tax. My read is that QE has pushed nominal returns so low that people are willing to accept negative reaal returns to protect the bulk of their money from inflation. This is the misselling inherent in QE. The Reserve is the market maker for Treasuries - it offers an effective bid (par on maturing notes), and a straight up ask (auction price). If it wants negative real rates on these things it just needs to fool the market into buying them for more than their grossed up value (or selling them for far less, or some less extreme combination of both) - it needs to widen the spread, moving the bid price way below par, and the ask way above the NPV of the underlying, or actually do both to a lesser degree than either. QE gives it every tool it needs to move these prices - QE allows the Fed to add liquidity, allows it to bid at its own auctions, and conceivably, also allows it to short-change itself as the gilts it holds mature. that is the logical thought....just wonder how a pension fund is supposed to make money inthis environment. course QE also boosts asset prices, so why would anyone buy these treasuries?...unless it is to hedge that QE does NOT take place again? these things are still a mystery to me. NIRP on nominal bonds has a floor though. It is the cost to guard, fireproof and insure cash held in a vault somewhere. Would your opinion change if the Reserve in question started defaulting on short dateds bought under its own QE program? This is the reason why most private sector pension funds have changed from defined benefit plans to defined contribution plans. The NPV of inflation protected, defined benefit plans (primarily in the public sector and public sector legacy companies) is rising dramatically as real returns collapse and go negative. This is not being reflected in our national accounts and is an accounting scandal on the scale of Enron. Legislation also forces some pension / annuity providors to hold a percentage of their assets in gilts within a defined term structure. This capitive market, along with increasing longevity, means that there is a captive market for gilts, no matter how low (or even negative) real and nominal rates go. This gets us back to the concept of the risk free rate that underlies so much of our financial and accounting framework. I have no idea what it is but I am certain that it is not the rate that we have traditionally used. Or if they insituted a program where each series of cash become worthless after a year unless it was exchanged for a new series of cash before the expiry date at a discount. It'll all be crystal for you lot once you can wrap your grey matter round that fact that these bond thingies are just money pretending to be owt else to cover up the fact that every sovereign government has been been happily printing away since 1971 without anyone except the invisible handed one being any the wiser . doh, we are blind... course deficit spending IS printing, but you knew that too and we didnt. Hello scepticus, coming to gloat and troll? It would work much better if you knew the difference between tips and normal bonds but hey, keep hoping. "I really do not see the signal"
Did you see my "state failure" thread yet? You really are clueless aren't you. Inflation linked bonds have returned negative IRs for months now and no, it doesn't mean TEOTWAWKI. scepticus, if you need negative interest rates to get yourself out of whatever financial mess you got yourself into, you might as well start thinking about a more constructive approach. Coming here to troll isn't going to help you. Our friend Scepticus is right though. If deflation hits us hard enough because there is no growth and our demographic problems get worse, nominal interest rates on bond / gilts could go negative. As long as we don't have an overly punative asset / wealth tax, this could be the best thing that has happened to the prudent on an after tax basis for a long time if real rates turn positive in a world of negative nominal rates. of course he is....what else are governments and Feds fighting? cant have savers having increased spending power....we must shake the money tree with fear, when our friend deflation wants to put things right. correctional action is always feared by the wrongdoers. I'm perfectly well aware of the difference between TIPS and conventional bonds thank you very much. TIPS are more cash-like (arguably they are better than cash), which is why they have gone negative first. And while TIPS yields may have been negative in the secondary markets for some durations I believe this particular news item does represent a first in the primary market, unless I'm reading the news wrong, which unfortunately remains a possibility. Lastly thanks for your considered points regarding my financial circumstances. Your advice and concern is noted. The place where the Austrian and Keynesian economics might meet is in a collapse in the velocity of money to zero and an implosion of the entiree monetary system no matter how much QE is undertaken.